Not to be confused with its Cuban counterpart, Fonseca Cigars is also a Dominican company which produces smokes in the mild to medium bodied range. With the Fonseca Vintage, Manuel Quesada blended a cigar to produce a richer, medium bodied smoke utilizing an Ecuadorian wrapper and Dominican fillers. Manuel has produced some fine cigars of his own and has a skillful hand when it comes to producing flavorful smokes. So I was looking forward to making this my first cigar of the day in order to fully appreciate what it had to offer. The Fonseca Vintage has a light, silky wrapper with no soft spots and is packed with a medium amount of tobacco inside. The classic band of gold and black with the signature “F” is present, followed by a black and gold secondary band with “Vintage” in cursive. The secondary band is the only discernible difference in the labeling as the Fonseca band itself is the same as the other lines in their portfolio. 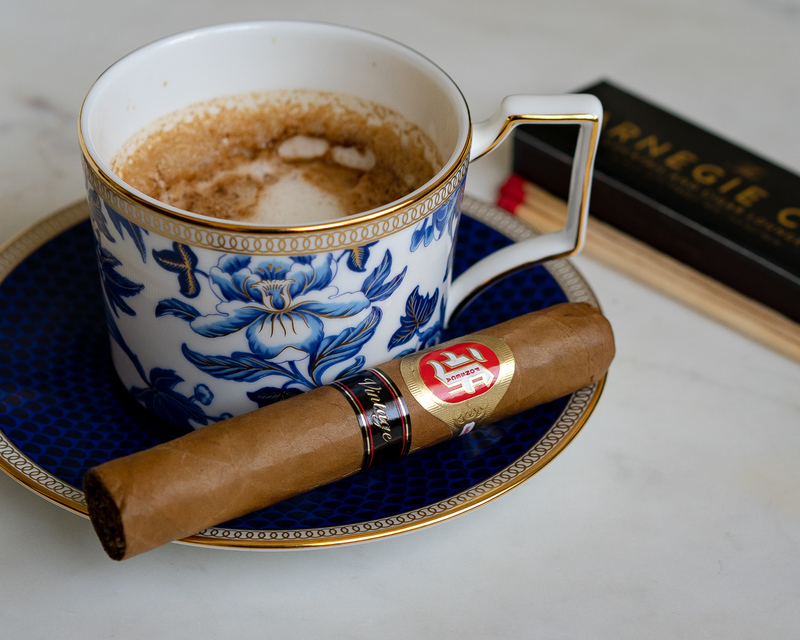 The cigar’s construction is completely smooth and seamless. After I apply a straight cut to the Fonseca Vintage, the draw is perfect. Lighting it up, leather immediately comes through along with toast and cinnamon. While I puff away, a nice amount of smoke emerges, bringing with it earth and an underlying dryness on the finish. The Fonseca Vintage produces a beautiful white ash, though it’s not too firm. Some café au lait hits the mid palate and coats the mouth, which by this point is a pleasant change of pace. The finish is still a bit dry, but the upfront flavors are pleasant. Around the midpoint of the Fonseca, I pick up malt and cereal notes, with tons of billowing smoke. Cocoa and cedar come through as well with a creamy finish. Additionally, there are woody flavors that intermingle with some salinity. Overall though, leather dominates at this point with some secondary tanginess. In the final third of the Fonseca Vintage, the leather continues to be the dominant flavor along with some creaminess. The cigar does not deviate much in terms of flavors from the previous two thirds. But, the cedar does return with a touch of vanilla and leather once again enveloping the palate. A consistent medium bodied smoke. The Fonseca Vintage is a great cigar for the smoker who enjoys light bodied smokes and would like to try a cigar with a solid medium flavor profile. Despite its lack of depth, it’s a nice smoke to help identify the balance between lighter and fuller bodied cigars. I believe this is the style Manuel Quesada was looking to achieve and it’s a testament to his range as a blender. The leather, cedar and vanilla are wonderful flavors and you will get plenty with the Fonseca Vintage. Reviewers Note: this was a non-blind review.